Customer satisfaction is our number one priority at Matt’s Roofing and Gutters. An Atlanta area owned and operated roofing business, we are dedicated to quality craftsmanship and outstanding customer service. Our integrity and thoroughness will make your roofing experience a rewarding one. Whether you are looking for a small repair or a large overhaul, you will benefit from our personalized attention throughout the duration of your project. We stand by our work by offering a 100% satisfaction guarantee on all our services. 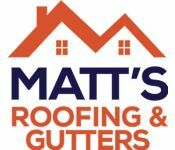 Matt’s Roofing and Gutters is a fully licensed and insured Atlanta area GAF Master Elite Contractor. We install only the finest products made by GAF, a nationally recognized provider of roofing materials. Because Matt’s Roofing and Gutters is a Master Elite Contractor, you benefit from the strongest and most comprehensive warranties available on the market. We spend time with you, explaining the many steps a roof repair or replacement involves and your options for ensuring the job is done right. During this consultation, our licensed contractor will fully inspect the roof and its support structure. Our proposal will give you all the details of the work to be performed, any warranties included with that work, and any other services our licensed contractor would recommend for your home. Once you accept our proposal, your Project Manager will walk you through the agreed-upon work and provide you with a detailed timeline for the project’s completion. During the installation, our licensed roofing team will perform an initial removal and cleanup of your old materials, allowing for an assessment of the existing structure and solid plans for the new structure. Once groundwork for the new structure is in place, we apply shingles, venting, and waterproofing (as needed) to the new roof. The last step of installation includes a final inspection and cleanup to ensure the work site and your home is clean. Your Project Manager will walk through the all work performed to ensure the project has been completed to your satisfaction. Once your Project Manager determines all work is completed, he will review any additional work done since the post-construction walkthrough and share with you the details of the warranty on all work performed. Once the project is completed, you will receive an Customer Satisfaction Survey. Your feedback allows us to continue improving and maintaining the customer-focused service we provide. Incredibly professional and efficient crew. Tore off two layers of roof, made repIrs, installed new roof, cleaned up and gone in 7 hrs. Impressive.